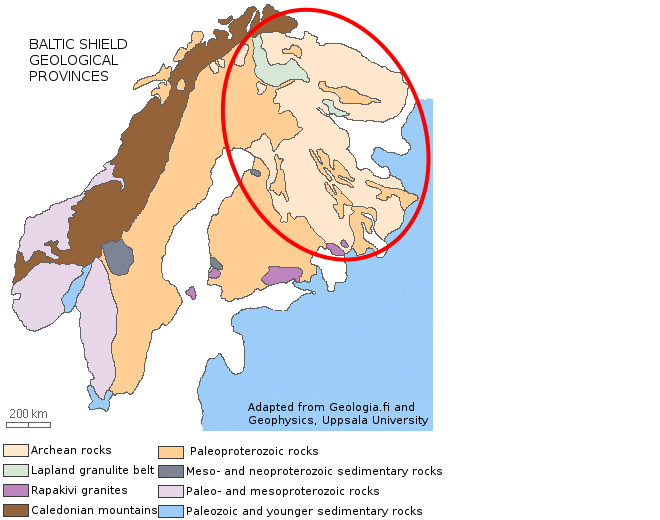 A large part of the bedrock in northern and eastern Finland is formed. Plate tectonics move continents together, forming the Kenorland supercontinent. Kenorland breaks up 2500 million years ago. The oldest geological provinces in Europe can be found from Karelia and Kola at north-western Russia and eastern Finland. The formation of the rock was most active at 2.7 billion years ago, when so called Belemorian belt was formed between Karelia and Kola as a result of a collition. The most common rock types formed at these events are gneiss, migmatite and granites. However, the oldest parts of the Karelia are much older. For example the oldest rocks in the Europe is the 3.5 billion years old gneiss from Siurua. Also narrow greenstone belts that probably originate from Archean volcanic islands can be found from Karelia. Kenorland is a hypothetical early supercontinent. However, there is not yet certaintly about it. Kenorland is thought to have formed c. 2.7 billion years ago, when several Archean cratons (early continents) acreted. It would have comprised e.g. from Ur and cratons that later became Baltica (North-Europe) and Laurentia (North-America). Baltica contained at this point only Karelia and Kola. Reconstruction of Kenorland is based on similar magnetisation of minerals and similar strata at different modern continents.